1. The total assets on the balance sheet have been stable at about $2 trillion. It's hard to imagine how it is possible to avoid balance sheet growth with all the quantitative easing. However the purchases of securities have been entirely offset by reductions in the various liquidity facilities. 2. 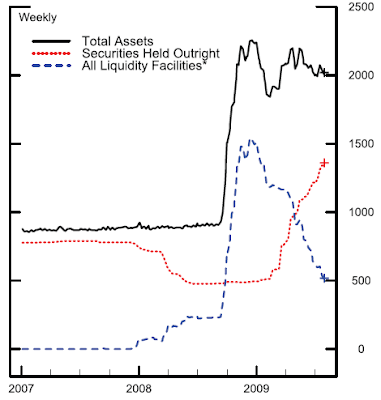 Liquidity facilities usage continues to drop. We've discussed reductions in the usage of TAF as well as CPFF. The Central Bank Liquidity Swaps represent transactions that allow other central banks to get access to dollars in exchange for their currency at market FX rate, while committing to return the dollars in exchange for currency at a contracted rate. The Swiss used this faculity as part of their bail-out of UBS, since UBS needed dollars. Other central banks needed the facility as well because for a number of foreign banks dollar financing had been cut off. Now with the reduced needs for dollars by other central banks, this facility usage has been on a decline. 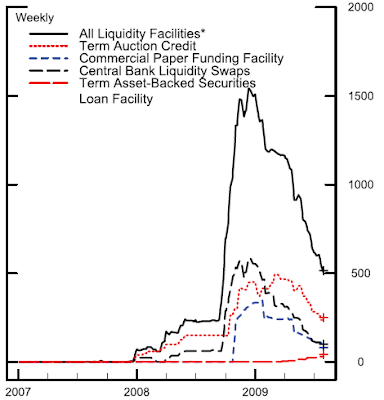 The one liquidity program that continues to grow, though tapidly, is TALF. However in the bigger scheme of things, TALF is not a significant contributor to Fed's balance sheet. 3. The securities component of the balance sheet has been growing quickly, with MBS purchases outpacing everything else. Quantitative easing continues to move in full force. For those interested in getting a new mortgage, now is the time. Once the MBS purchase program is over, mortgage rates are sure to go up. 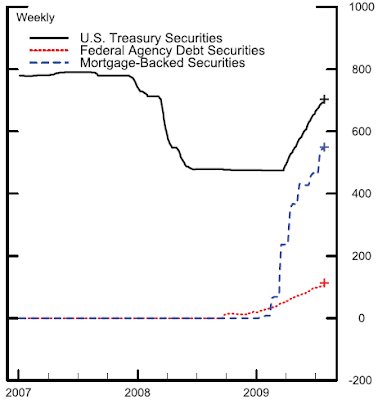 The Fed's position in MBS and agency paper combined is now about the same as their holdings of Treasuries. 4. One of the items that stands out in the report is the Maiden Lane portfolio, the facilities set up for Bear Stearns and AIG. In particular the Maiden Lane - II (ML-II) has deteriorated. Unlike ML-III (the other AIG facility which is diversified), ML-II is backed by mortgage linked paper, and with mortgage delinquencies continuing to rise, this is not a surprise. The idea was that it will generate enough cash flow to pay down the facility faster than the decline in collateral value, which is not happening. ML-II will be the facility to watch closely going forward.